Compared with its predecessor Galaxy Note, Galaxy Note 2 is a little bit narrower and lighter from 82.95x9.65mm to 80.5x9.4mm, which may make it easier for people to hold and play videos (MKV) on Galaxy Note II on the way. With 5.5-inch HD Super AMOLED screen (1,280x720-pixel resolution) and increased battery life, Galaxy Note 2 seems to be an ideal Samsung player for HD videos MKV, AVCHD, etc. On top of that, Android OS 4.1 and quad-core processor also give Galaxy Note II a bonus point for playing HD videos MKV AVCHD smoothly. According to the specification of video format, Galaxy Note 2 is compatible with MKV, MP4, WMV, FLV, etc. So why are we here talking about getting a Galaxy Note II converter to convert MKV to Samsung Galaxy Note 2? From feedbacks of this phablet’s users, sometimes they just cannot play MKV on Galaxy Note II, out of the problem of the MKV video or of the hybrid device itself. Anyway, people have problems, so we find a way out for them. And that’s why we recommend you to convert MKV to Galaxy Note 2 for exact compatibility. To get out of such video format trouble, a HD MKV to Galaxy Note II converter is needed, not only for converting MKV to Galaxy Note 2, but also for the conversion of MKV to iPhone, iPad, iPod, HTC, Nokia, Xbox One, Sony PS3, and any other portable devices. In this case, WinX HD Video Converter Deluxe could be the best option for you. Other than its ability of converting MKV to Galaxy Note 2 and all popular gadgets, this Galaxy Note II converter can also fast convert HD SD and UHD videos at one go without quality loss, for its unique high quality engine. Download and install Galaxy Note 2 converter first before you take a closer look at the guide below of how to convert MKV to Galaxy Note II (on Windows). For Mac users, click to get Mac version. It can perfectly work on Mac OS X 10.11 to 10.6 systems. 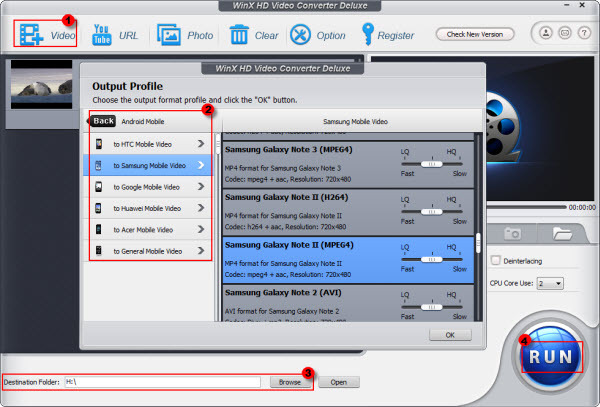 Step 1: Launch WinX HD Video Converter Deluxe and click the button "+ Video" to load your source MKV video and get ready for the conversion of MKV to Galaxy Note II. Or you can just drag the video file directly. Step 2: Set the output profile. 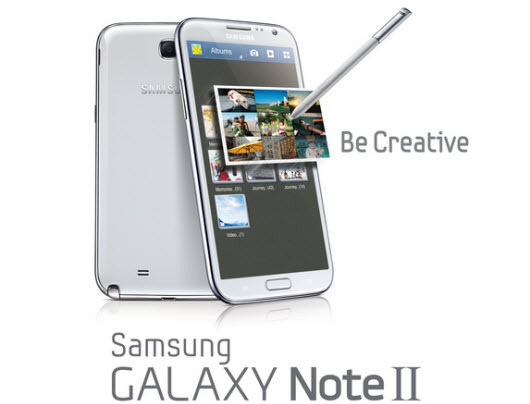 With 280 preset profiles, this Galaxy Note II video converter enables you to convert MKV to Samsung Galaxy Note 2 precisely. Choose "to Samsung Mobile Video" in the catalog of "Android Mobile" and a long list of output formats of Samsung will be shown to you. Then select Samsung Galaxy Note II (MPEG4, H264 or AVI) as the target format. Step 3: Choose a destination folder by clicking "Browse" button. Step 4: Click button "RUN" to begin your MKV to Samsung Galaxy Note 2 conversion. As all-in-one video converting software, this Galaxy Note II converter is also available for you to make vivid photo slideshow, edit video for personalization or download YouTube videos with incredibly fast speed, which may be the best part for YouTube video loving hipsters. To better enjoy HD MKV video on your Samsung Galaxy Note II with no worries about video format, download WinX HD Video Converter Deluxe and give it a try! WinX DVD Ripper Platinum: Advanced version of WinX DVD Ripper, converting DVD with excellent quality at fastest speed, rip DVD to AVI, MP4, MPEG, FLV, MOV, WMV, iPhone, iPod, iPad, WP8, Android Samsung, Nexus 7, HTC, Kindle Fire, PSP, Huawei, etc. Makes perfect 1:1 copy within 5 minutes. Constantly update to defeat new DVD copy protections. WinX DVD Ripper for Mac: Mac version WinX DVD Ripper Platinum, runs perfectly on Mac OS X Tiger/Leopard/Snow Leopard/Lion/Mountain Lion, convert DVD to MP4, MOV, iTunes, iMovie, FLV, MPEG, AVI on Mac computer, and rip DVD to iPhone, iPod, iPad, Apple TV, Android, Samsung, and other device friendly videos.